If you want to learn how a little-known director gets a big budget, Oscar-bait vehicle, watch Headhunters, a clever, fast-paced thriller about a corporate recruiter/art thief who gets in over his head financially and otherwise. An engrossing thrill ride with a “wrong man” Hitchcockian vibe, the film’s only stumble is an overly intricate initial plot device that introduces the protagonist to his tormentor. Otherwise, this is a cool, steady, occasionally grisly film in the vein of Blood Simple. 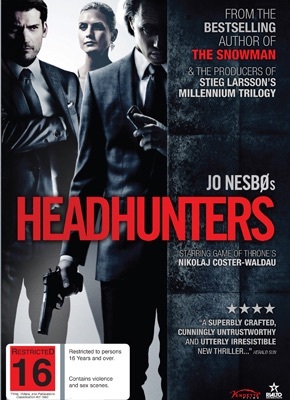 Headhunters was a massive success in Norway, which translated to about $14 million foreign but just over a mere million here in the U.S. Still, Hollywood noticed and selected director Morten Tyldum to helm a picture that had absolutely nothing in common in style, substance, or feel with his breakout movie, the woeful The Imitation Game. Of course, that film was nominated for Best Picture, so what do I know. I just hope Hollywood similarly rewards Jeremey Saulnier (Blue Ruin) and Jennifer Kent (The Babadook).